Browsing the headlines, the world looks a dangerous place. Boko Haram is bombing its way across Nigeria, civil war in Syria, transnational terrorism and more. But the biggest danger is conspicuously absent from the headlines: the world’s 17,000 nuclear weapons. When fully implemented, the CTBT will form an important barrier to nuclear proliferation around the world. Eight specific countries still need to ratify the treaty**, including the United States. American foot-dragging not only prevents the treaty’s full implementation, it provides countries like India or Pakistan a convenient excuse to avoid signing. Two decades after the fall of the Berlin Wall, US and Russian nuclear arsenals are still on a hair-trigger launch status. There is no reason for these two countries to be just minutes from starting a catastrophic nuclear war. Both countries should recognize the danger of accident or miscalculation and take their weapons off high-alert. The aging nuclear arsenals of the United States and Russia are at a critical juncture. They need to be either retired or they will be refurbished (at the cost of hundreds of billions of dollars). Instead of spending billions to overhaul unusable weapons, they should be dismantled. The money saved can be invested in programs focused on post-9/11 security challenges. Together, the United States and Russia still have 98% of the world’s nuclear weapons—enough to annihilate all humanity many times over. These stockpiles are expensive to maintain as well as being dangerous and unusable. A good step towards eventual elimination is to reduce their respective stockpiles to under 1,000. Once under 1,000, US and Russian stockpiles will be close enough in number to that of China, France and the United Kingdom that it opens the door for deeper reductions among these nuclear powers. Here, the United States in particular can lead the way by removing its tactical nuclear weapons from Europe. Pakistan and India are widely seen to be the two countries most likely to engage in a nuclear war. In spite of this, the two nations have yet to establish the safeguards that prevented a Russian/US Cold War nuclear incident. These two bitter rivals need to finally engage in serious dialogue to de-escalate tensions, find common ground and resolve long standing issues, including the status of Kashmir. In addition, there needs to be renewed international diplomacy with nuclear-armed North Korea. The United States, China, South Korea and Japan need to 1) de-escalate tensions on the Korean peninsula; 2) develop a common position and tighter coordination; and 3) restart serious diplomacy with North Korea to eliminate its nuclear program. The United States remains the behemoth of international diplomacy. As the world’s first nuclear weapons state and current owner of the second largest nuclear arsenal, the United States is uniquely positioned to take on a leadership role in pushing for nuclear disarmament. History has shown that when the United States has the will, it is capable of being the driving force behind history’s greatest disarmament successes: the Non-Proliferation Treaty (NPT), the New START Treaty, SALT I and SALT II treaties and the International Atomic Energy Agency (IAEA). The idea of reducing nuclear arsenals still commands broad non-partisan support in the United States among the voting public, former presidents, Secretaries of State and Defense, security experts and members of Congress. Now is the time to make this issue a foreign policy priority. Even in a post-9/11 world where the threat of terrorism is seemingly omnipresent, nuclear weapons are rarely top of mind for most people. This despite the catastrophic threat and the hundreds of billions of dollars of taxpayer money that has been, and will continue to be, spent on them. 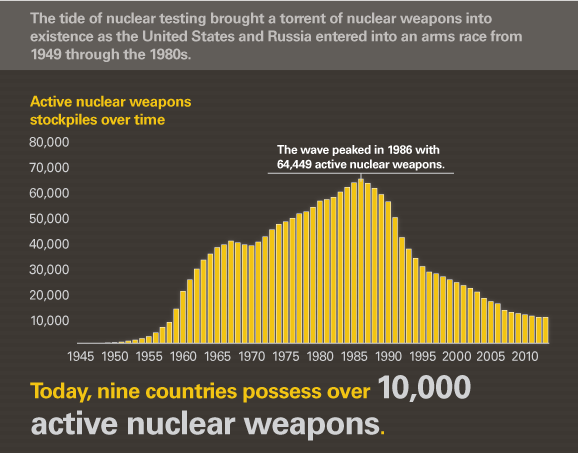 What are the risks of nuclear weapons? Do they make us more or less safe? How much money is being spent? Is this the best use of taxpayer money? Do we need them at all? These are very serious policy questions that must involve the American public. This debate requires an active, informed public pushing politicians to engage the issue. **China, Egypt, Iran, Israel and the United States have signed but not ratified the Treaty; India, North Korea and Pakistan have not signed.